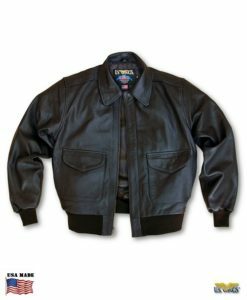 The B-3 is THE classic WWII “bomber” jacket. It’s warm, stylish, rugged & timeless and can be relied on to keep you warm on the coldest winter days. Made in the USA. NOTE: Please allow an additional 2-4 weeks for shipping. 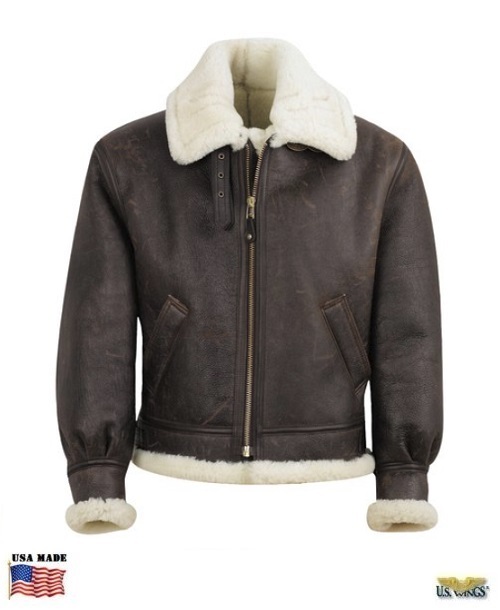 The B-3 Shearling Bomber Jacket is THE classic WWII sheepskin leather “Bomber” jacket! Because the B-17s and B-24s were not pressurized, the unheated cabins were extremely cold at the high altitudes. 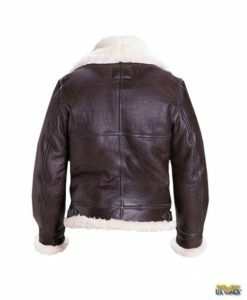 This was the jacket that kept our bomber crews warm during their perilous missions in the skies over Europe. The B-3 Shearling Bomber jacket is clearly a winner in both warmth and style. Even non-aviators like General George Patton chose to wear a specially-modified version of the B-3! Modeled after the original WWII Shearling jackets, the B-3 jacket is classic, rugged, and timeless. You can rely on this classic heavyweight to keep you warm on the coldest winter day, and you can count on its enduring style to survive the trends of fashion! US Wings® – The Professional Look. Made in the USA. During 1942, the B-17 Bomber plane, also known as the Flying Fortress, was introduced in Europe. The B-17 would prove essential in winning the war. The crewmen were flying grueling 8 to 9 hour missions over the skies of France and then Germany, as the bombing campaign intensified making it essential for the crew to retain body heat in the cold, unpressurized cabins at altitudes of up to 30,000 feet. 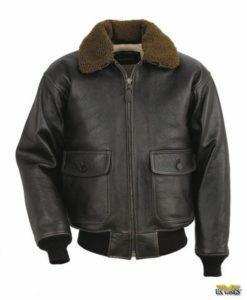 It was then that the B-3 Shearling Bomber Jacket made its appearance and earned its place in aviation history. This durable and practical yet stylish jacket withstood the elements while providing much needed protection and comfort to the battle-weary men. The B-3 Shearling Bomber Jacket continues to remain an icon of American style and fashion. Just a little info for you. My uncle was a Top Gunner/Radioman in the 15th Air Force, flying B-24H Liberators, 376th Bomb Group, 514th Squadron in World War II. He was shot down over Moosbierbaum, Austria and they crash landed their plane in Yugoslavia. His whole crew survived and was helped by the Tito Partisans to later get back to Italy and was repatriated with his squadron. 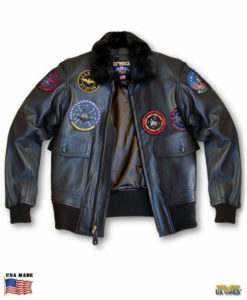 His Co-Pilot wrote a book about their experience called, “Shot Down In Yugoslavia.” I still have the B-3 Shearling Bomber Jacket that I ordered from you on 12/09/06 as a tribute to my uncle and it is still going strong and looks amazing as I wear it with extreme pride! I wore it in Germany in 2010 when it was brutally cold and they got real heavy snow…I was toasty warm with absolutely no complaints! No matter how long we stayed outside while my wife showed me all around, I never shivered once! This time I got the Cockpit USA RAF Sheepskin Bomber Jacket. Once again, I am extremely happy! Your products are the best quality, in my experience, and I just wanted you to know that I appreciate you and your staff and salute you/thank you for your service as well! My father was in Vietnam, also. I just thought you might like a little feedback on your excellent products! If I could give you 10 stars, I would without hesitation! Thank you so much. 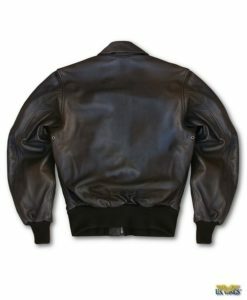 I received the leather jacket today (sheepskin B-3) – the size is perfect, it is beautiful, and I am very happy with the jacket. Thank you so much for your excellent and quick service! Hello from upstate NY. 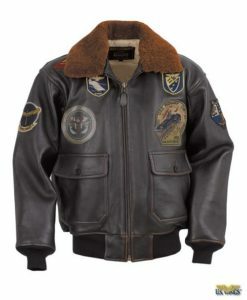 I have a U.S. Wings B-3 Jacket. Made in the U.S.A. and your size 48 fits like a glove. Its the warmest jacket I have ever owned and I only wear it on very cold days. Thank you for the great service. I am so enjoying my new jacket (B-3), especially here in Canada. I also congratulate you on your “much too brief” book. I wanted it to go on and on. Please consider writing longer version, I am sure it would be successful. I also had adversity and came back from it, so I was able to identify clearly with some of your experiences. Thank you again. I received my B3 bomber jacket just now and it is EVERYTHING and MORE that I had hoped for from the minute I set eyes on that baby in your online store. My grandad had one from his bomber days and when he gave it to my brother, I was very saddened. I had always been in love with that jacket. I’d made it my mission in my young life to get one EXACTLY like it (minus the patches). Little did I know it would take almost FORTY YEARS to get one! Yet finally, finally, FINALLY… it came! My own little Christmas miracle!! The fit is excellent, the style is OUTSTANDING and I am one HAPPY customer. Make that one happy LOYAL customer!! You’ve got a customer for life here, folks, Not that you need another one, but you’ve got one. The quality and workmanship of your craft is just out of this world. I will wear this jacket with pride, both for what it stands for, as well as the fact that I never gave up hope that I’d eventually find one just like the one my grandfather had. Thank you so very much!! You made my Christmas!! And thank you, too, for calling me beforehand to let me know that you didn’t have my first choice in size, AND for going out of your way to find the next closest up. It’s PERFECT! You’ve got fantastic customer service to match your fantastic products. Rare in this country anymore, and that’s why I’m going to stick with you and to tell all my friends to go ahead and do the same. Thanks again, and Merry Christmas/Happy Holiday/Happy Weekend to everyone and your families! 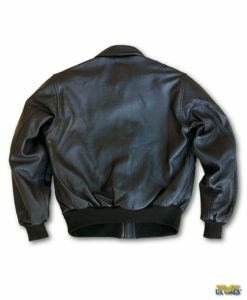 The B3L sheepskin bomber jacket that I purchased from you came this afternoon. It fits and looks great. I want to thank you for your help and everyone at US Wings for selling a fine American made product, at a fair price. Many Americans might not care where something is made, but myself and others like me do! I hope that you continue to sell products made in this country, so that someday my grandchildren will still be able to buy something still made here, besides hamburgers! The jacket (sheepskin B-3) arrived and you should have seen the look in my wife’s eyes. She is proudly driving her Roadking wearing your jacket and loved the booklet that was added to the jacket. She finds you very brave to take that step many moons ago. Wish you all the best and of course the same to your enthusiastic team.